For all those who have been following the renovation, here’s the (almost) finished article. 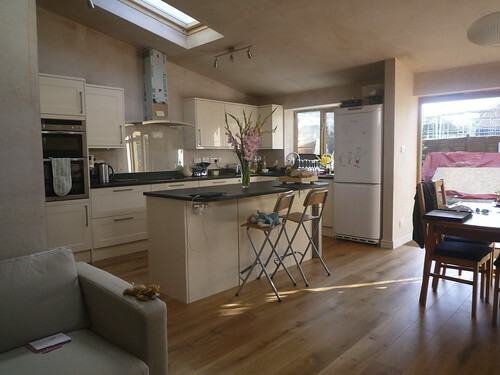 We still need to decorate and there are a few minor things to finish off (not least the garden and removing the plastic from the cooker hood) but it’s pretty much liveable in. It’s a large L-shaped room, with a kitchen area, a dining area and a couple of sofas. It leads through into what used to be the dining room (part of the original house) and which is now Clara’s playroom. This is taken from just outside the playroom. More pics in the renovation set.